The Horse:Your Guide To Equine Health Care provides monthly equine health care information to horse owners, breeders, veterinarians, barn/farm managers, trainer/riding instructors, and others involved in the hands-on care of the horse. 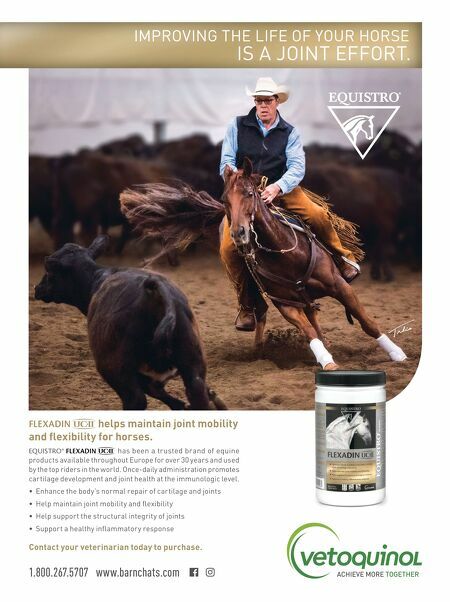 FLEXADIN helps maintain joint mobility and flexibility for horses. EQUISTRO® FLEXADIN has been a trusted brand of equine products available throughout Europe for over 30 years and used by the top riders in the world. Once-daily administration promotes cartilage development and joint health at the immunologic level. • Enhance the body's normal repair of cartilage and joints • Help maintain joint mobility and flexibility • Help support the structural integrity of joints • Support a healthy inflammatory response Contact your veterinarian today to purchase. 1.800.267.5707 www.barnchats.com IMPROVING THE LIFE OF YOUR HORSE IS A JOINT EFFORT.